This probably will not be of interest to very many readers, but just in case: I have started keeping a blog with original articles about learning West Frisian, the most commonly spoken dialect of Frisian. You can read it here. 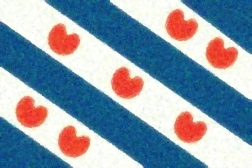 Allegedly, Frisian is the closest living language to English, although some Norwegian linguists dispute that claim. My interest is more personal, however, since my fulltrui Forseti (Fosite) has ancient associations with Frisia. I even came across an example of Him being listed before Thor and Odin in a Wikipedia article in Frisian. That is not something you will see in very many places by any means. Studying the modern language is one way that I honor Him. If you do happen to have an interest in West Frisian, please check out my newest blog and let me know what you think.